The Gas-Liquid Cylindrical Cyclone (GLCC©) compact separator replaces bulky conventional vessel type separators and can be suited for many different oilfield applications. MSI International Inc has the experience and knowledge to custom design any GLCC to fit your needs. The GLCC was patented by Chevron in 1992 and is currently managed by members of a Joint Industry Project. Presently, over 4300 GLCC’s have been successfully installed in the field. 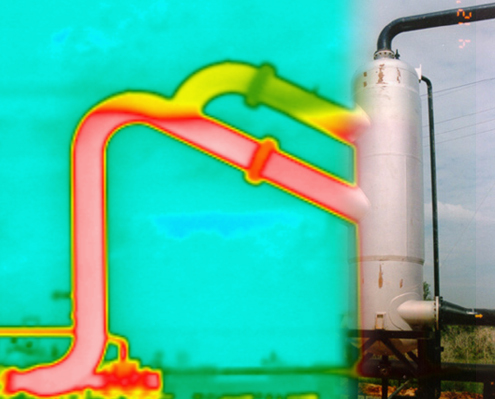 The GLCC can be designed for various levels of expected performance when used for two-phase gas-liquid bulk separation. Typical performance levels range from 0.5–2.0 gallons of liquid per MMscf in the gas leg and 0–5% gas in the liquid leg. The GLCC utilizes centrifugal and gravitational forces to separate the gas and liquid phases.